Situated about a mile south of Sargent, this steel bridge carries an unpaved private road across the Middle Loup River. The Nebraska State Engineer delineated the Sargent Bridge in 1908 as two 120-foot Pratt through trusses carried by steel cylinder piers. 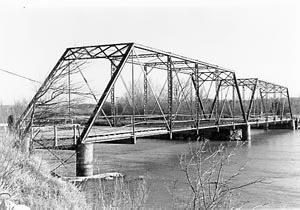 The structure was fabricated and built that year by the Standard Bridge Company of Omaha. Later incorporated into U.S. Highway 183, the bridge was abandoned as a public thoroughfare in the 1960s and acquired by the Middle Loup Irrigation District, which currently maintains it for private access to its diversion dam. The Sargent Bridge for decades served as a regionally important river crossing and a gateway to the town of Sargent. It is today noteworthy as one of the oldest surviving structures designed by the state engineer's office.